The Church in Lagos came out in style on Saturday 9 March 2013, at St Leo’s Ikeja, to commemorate with the SMA the first Mass celebrated in Nigeria in modern times. On 9 March 1862, Fr Francesco Borghero SMA celebrated Mass in the home of an Italian trader, Mr Carena near the present Holy Cross Cathedral, 151 years ago to the day. This first Mass was also the birth of the Church in Nigeria. The principal celebrant of the Mass was the Archbishop of Lagos, Most Rev Dr Alfred Martins, assisted by Bishop Albert Fasina of Ijebu-Ode and up to eighty priests. Among the concelebrating priests were Monsignors Aniagwu, Okodua, Hoteyin, Ogunmodede, Boyo and, at the age of 102, Monsignor Pedro Martins. Many other congregations sent representatives including the St Patrick’s (Kiltegan) Fathers who were represented by Frs Pat Murphy and Tommy Hayden. Most SMA’s who could be there were present. The SMA Regional Superior, Fr Maurice Henry, from Abuja, and Fr Tom Treacy from Kano travelled long distances to honour the occasion. Sisters even surpassed the priests in numbers with OLA Sisters led by their Provincial Sr Assumpta Mordi as well as Sisters from the following Congregations: Eucharistic Heart of Jesus, St Louis, Holy Child, Franciscans of the Immacualte Conception, Paulines and Carmelites. At least 600 others attended, which was much less than expected. 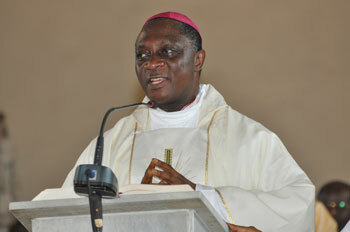 Reflecting on the journey, Archbishop Martins said that when Fr. 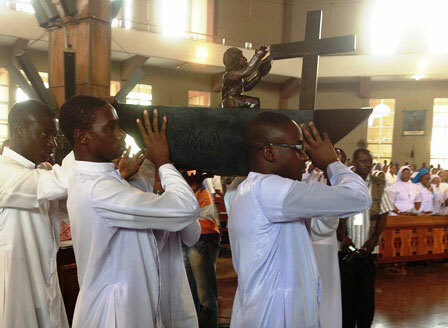 Borghero SMA said the first Mass there was only one priest and no religious in Lagos but that now there were 120 local clergy, 78 from other dioceses and 100 religious and Society priests. In his 45 minute homily, which deserves to be read in its entirety, Fr. 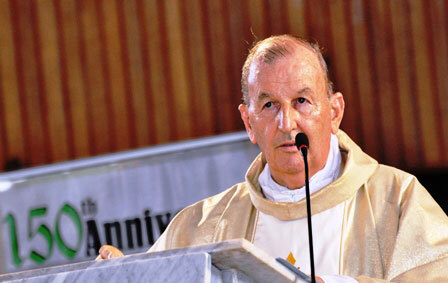 Eddie Hartnett SMA gave an historical overview of the growth of the Church and the work of the SMA, not only in Lagos, but throughout Nigeria. Much to the delight of the congregation he moved effortlessly from English to Yoruba, to singing in Ogun and back again. It was a time for once, he said, to blow the SMA trumpet and he did it well but gently. An interesting point that he made was that before the SMA came on the scene there very many efforts to establish the Church which did not bear fruit as they were more or less freelance efforts. What made the SMA different was that they came with a mandate and set up structures leading to the first bishop in Lagos, Bishop Jean-Baptiste Chausse SMA in 1891 and the first Nigerian priest, Fr Paul Emechete in 1920. Towards the end of the Mass Fr. Reginald Nwachukwu SMA, Superior of the Bight of Benin, announced that the Archbishop-emeritus of Lagos, His Eminence Anthony Cardinal Okogie, had been admitted to Honorary membership in the SMA by the SMA Superior General and Council. 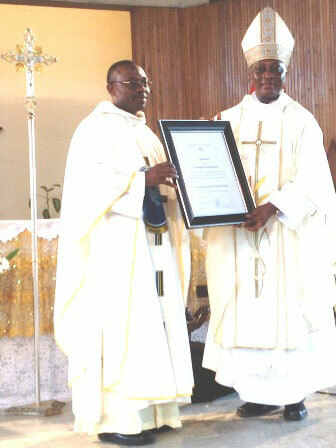 Archbishop Martins accepted this honour on behalf of the Cardinal, who is in Rome for the Papal Conclave. Much to the delight of all present Archbishop Martins announced that henceforth the Cardinal will be addressed as His Eminence Anthony Cardinal Okogie, SMA. Great credit is due to the organizers of the celebration, Fr. Debres Trinkson SMA (India) assisted by Fr John Suakor SMA and Fr Henry Obiora SMA from Nigeria. As the SMA moves forward it seems that there is a change of crew and if the organization of this celebration is anything to go by, the SMA can sail into the future with confidence. With the celebration taking place in St. Leo’s at Ikeja it was also a time for older people in the parish to ask about former crew members who in the past piloted the boat through Ikeja waters: Dan Murphy, who got the land for the Church, Jimmy Morrison, Hugh Ford who built the Church, Martin Kavanagh who wrote his most powerful letters from here, Willie Cusack, John Hannon, Mick Ryan and Jimmy Friel to name a few.